We; as Tekstil Business Magazine, have come a long way in such a short time in publishing. 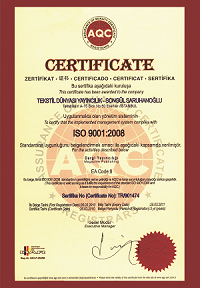 We received ISO 9001: 2008 Certificate as of 26.03.2010 as a fruit of our work. We have adopted as a responsible and standing upright style from the very first days of our broadcast life, which begun in 2007. We continued to keep our ever growing quality journalism with strictly following the objectiveness. With our countinuing work and researches, we have been the eye and ear of sectors. Tekstil Business Magazine's publisher ECR Publishing registered its brand after successful works of quality management and international standardizations. Tekstil Business, has gone a very long way in such a short publication time, finalized its efforts for securing its brand and patent trials in 2009. Our brand is registered under Brand Registration Certificate by Turkish Patent Institute on March 2009.Publication contents and circulations web formalized globally, ECR Publication has turned into a brand that has been followed with great interest. The institutional vision of leading magazine Tekstil Business, described the next step location of our magazine among others: Trust our advertisers and continuity in publication for our readers. We are the first magazine to have certified its circulation by notary office. These notary certifications performed 4 times a year regularly in order to prove the importance we give to our publication vision, advertisers, readers as well as certifing the number of circulation we commit to the industry. Tekstil Business is published with an environmental-friendly understanding so as to protect natural resources and to maintain sustainable production in the industry. In that sense, we realize two different studies together. Initially we print our magazine to FSC certified papers. This means that we do not destroy forests with this certificate. We make maximum use of limited natural resources with the most appropriate methods. Another study is our e-magazine application which received great appreciation from the industry. We publish the original magazine on the internet in a pdf format for our readers. Consequently our readers can have an easy and unlimited access to the full content of our magazine without any restriction with only one “click”. Şenlikköy Mahallesi Hat Boyu Cad.